i bought MARLEY & ME off the internet, and the only reason i even thought about buying it was because of work. i’ve never been much of a dog lover, though we’ve always had a pet dog for as long as i can remember. i felt a disadvantage among my co-workers, since a lot of them are big on dogs. 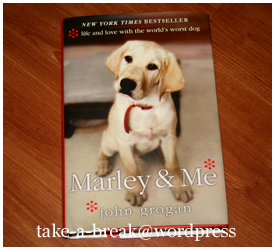 so when i saw the MARLEY & ME book amongst those being sold online, i decided to buy it. and read it. and well, it was a revelation. having only been exposed to very mild dogs–the largest of which was a doberman, back when i was a toddler–i don’t actually relate to the problems the author faces in his many anecdotes. but while reading his stories, i couldn’t help but cringe at the misadventures the titular dog gets himself into. at one point in the book, the author’s wife tries to get him to give marley away. and i couldn’t blame her. remember, i’m not really a dog lover. but as the story progresses, marley’s ‘problems’ never really go away. there is no happily-ever-after waiting in this story. instead, what you get in the end is acceptance. and love. you see, for all of marley’s faults, the grogans adore him. and even when the author is enumerating the numerous things marley had once again done wrong, you can feel the love emanating from the words he wrote. that’s why, when you reach the end of the book, with the inevitable death of marley approaching, you can’t help but feel the pain and the sadness creeping in. i’m not big on the crying thing. i can name only five works of fiction to have made me cry. but i confess to tearing up at the end of MARLEY & ME. marley may be the world’s worst dog, but for the author, his wife and his children, marley wasn’t just a dog. he was family. this book is a great work of non-fiction for dog lovers and non-dog lovers alike. i’m a late DOCTOR WHO convert–a very late convert. i’ve been intrigued with the show since it came back in 2005, but never got around to watching it until 2010. yep, it took me five years. what held me back? the promise that british sci-fi television shows have lousy sets and special effects. this shouldn’t have bothered me in the least, seeing as i’ve been watching a lot of local shows. but it bothered me. still, by the third season of the new series, i’ve been reading a lot about how good the stories are, so i figured, bugger it. i’m gonna give DOCTOR WHO a chance. and then fear grabbed a hold of me. what if i don’t understand anything? they changed doctors and all, but in 2008, david tennant was already in his second year as the doctor. and billie piper was gone. how the hell was i going to catch on? and then, also in 2008, they announced that david tennant was leaving. or rather (and i looked this up on wikipedia, so forgive me if this information is false) he announced it himself. there were already talks of casting a new doctor, and that’s when i decided that i really am going to watch DOCTOR WHO. honestly though, i forgot about this promise until 2010. and by then, matt smith’s eleventh doctor was staring me through so many web ads in websites i frequent. and then i took a deep breath, and jumped. in june of 2010, i found myself browsing through bestsellers (the store) at the podium (the mall). i was actually looking for books by christopher golden, or robert liparulo–or any of the usual books i read. meaning: fantasy books. but while browsing through the sci-fi collection (where they sometimes include christopher golden), a word calls out to me. granted, i hated the daleks in “victory of the daleks”. i thought that as villains, they looked very rubbish. of course, i changed my mind in “the big bang”, but that was still some episodes to go. but back to the book. upon taking it off the shelf, i thought it was a work of fiction. my eyes weren’t quick to spot the “a memoir” bit on the upper left corner of the book. and then i saw it, and i decided to let the book go. five minutes later, i was holding it again. against better judgment, and a long list of credit-card purchases, i bought the book. i didn’t actually go around to reading it until after i finished off my book pile. which i did last week. and then things-to-do just started trickling in, and i never found time to read the book. and then today, i got lazy and just lazed about–and read the book. this is actually my second memoir. the first one, A LITTLE BIT WICKED, was kristin chenoweth’s autobiography. 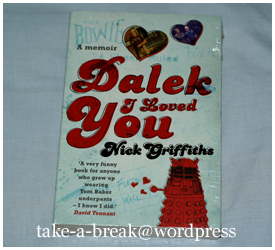 and well, DALEK I LOVED YOU is the memoir of a person i don’t even know. i only bought it because it was related to DOCTOR WHO. but i wasn’t disappointed. and he’s been around a couple of decades before me. so there’s that too. from what he’s written, life back then was very peaceful. and it only started to change for him a couple of years before i was born. how do i know this? he mentions in his book a period in his life when a lot of bad things were happening everywhere else in the world–and one of said bad things was the assassination of benigno aquino. that happened in 1983.
so yeah, DALEK I LOVED YOU is full of interesting stuff. but i don’t think i’ll be recommending it to anyone who doesn’t have interest in DOCTOR WHO. and even then, i’d ask you first if you really, really want to read the book.